Residential and commercial sales and installation of large and small HVAC equipment including furnaces, air conditioners, heat pumps, ductwork, geothermal, ductless mini-splits. Service and replacement on all residential and commercial HVAC equipment including commercial refrigeration. Custom metal ductwork, flashings, chase caps and sheet metal fabrication in our sheet metal shop. We offer a flexible approach to commercial HVAC system installation. With over 33 years of experience, we’ve learned that no two projects are alike, large or small. All clients like and deserve the same things: prompt project completion and knowledgeable responsive communication. We strive to deliver all projects on time, at competitive prices and maintain the highest quality of customer service and workmanship throughout the process. Geothermal technology offers the most energy-efficient way to heat and cool your home, saving up to 70% on your energy bills for heating, cooling, and hot water. Geothermal, also called ground source technology, uses the consistent temperature of the earth to heat and cool your home through the use of water and refrigerant. Heat is absorbed from the earth or expelled to the earth and transferred into your home. The system is considered sustainable, requiring no venting and the lowest emissions and operating costs of any heating and cooling options available. 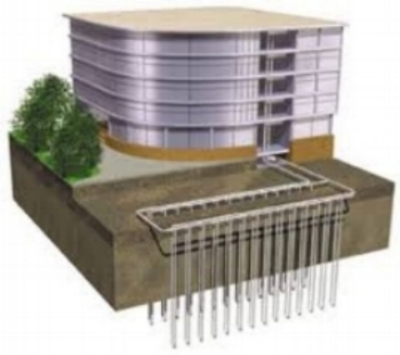 Vertical ground loop systems offer an effective and consistent solution for heating and cooling your home. Installation is less disruptive to lawns and landscaping than a horizontal system. Installation tends to be more disruptive to lawn and landscaping when installed. The system may be less consistent in extreme weather conditions. Will installation ruin my yard? Vertical loop installations typically require one well per ton, in the area the well is installed the lawn surface will be disrupted. The size of the area depends on the tonnage. This area of the lawn may require landscaping. A horizontal loop system will require extensive landscaping to repair the lawn. Can I use geothermal in an existing home? Yes you can! Though you may consider replacing your current ductwork. The maximum benefit from a geothermal system is achieved when paired with the proper size ductwork for your chosen ground source system. 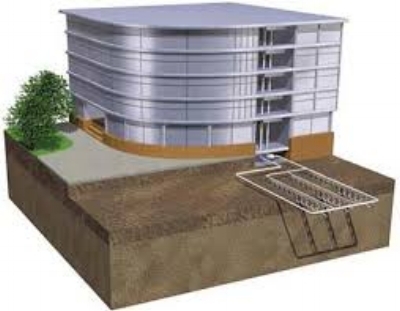 If ductwork replacement is not an option then the full efficiency of the geothermal system may not be reached. It will still give added value in energy savings, but the payback may not be as quick. What kind of rebates are available? Costs of geothermal systems can be reduced to a cost-effective amount with the assistance of federal government and local electric cooperative rebates. Payback depends on your home and the system you choose to install. Return on investment varies but is typically well within the life of the system. Do geothermal units maintain the same level of comfort as a gas furnace? Yes. Geothermal systems maintain the same level of heat as a properly sized gas furnace. Our company started with the philosophy to do a quality job at a competitive price and treat our clients like we want to be treated. For over 33 years, that philosophy has proven successful and we strive to maintain the trust and respect our community has in us. We are available 24/7 to take care of your commercial or residential needs. We repair most all residential and commercial equipment, not as much on the industrial side. Honestly, if we don’t know something we’re going to tell you we don’t know it. For example, if you have a steam boiler system from 1940 then we’ll have to refer you to the people who specialize in repairing that equipment. What types of manufacturer warranties do you honor? We honor the warranty of all systems we install and most of the major manufacturers as well. Be sure you have completed any online registration and other processes required by your manufacturer to guarantee you receive all of the warranty for which you are eligible. If you have a question about if we honor a specific manufacturer’s warranty please give us a call. Do you offer a warranty on workmanship? We honor our workmanship with a one-year warranty, extended warranties are available. We offer a lifetime guarantee on our ductwork. Please contact us to discuss your warranty options. Free estimates are only available for equipment change out and sales, total systems, and new construction. We charge for diagnostic service and repair calls. Do you offer reoccurring maintenance programs? To ensure peak efficiency and reduce reoccurring costs we suggest a maintenance program. Even the highest efficiency equipment won’t run at its best capacity unless it’s properly maintained. Our scheduled maintenance agreements do not have a monthly fee, you pay as work is completed. A STAR representative will call you to set up an appointment to see if your system is in need of maintenance and let you know how everything’s doing. Payment is required upon completion of the job. We accept cash, check, Visa and Mastercard. 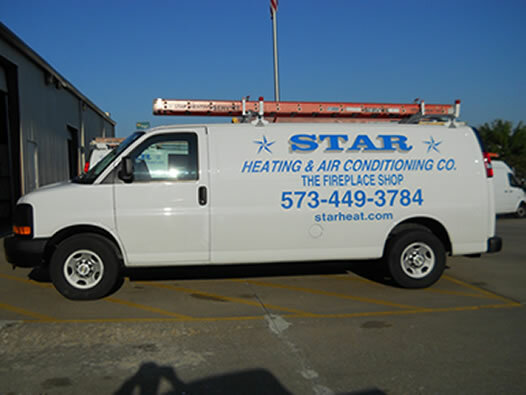 Our sheet metal shop has been providing custom ductwork since Star Heating and Air Conditioning opened its doors in 1984. We’re proud to fabricate our own metal ductwork and offer quality fabrication services to others in the area. We work on large and small projects of all shapes and sizes. Feel free to contact us for a free estimate on your custom fabrication project. © SHAC | All rights reserved.